Perfection Architectural Systems is a recognized leader in providing aluminum walkway cover, canopy, and sunshade systems in North Carolina. The needs of every building and walkway are completely tailored to specifications, customizing structures appropriately with designs that complement every environment. With thousands of projects completed and the experience and knowledge garnered from each, Perfection Architectural’s expertise will ensure your aluminum structure is constructed exactly as envisioned. Perfection Architectural Systems has millions of square feet of aluminum walkway covers installed across the country. Respected architects throughout the Carolinas regularly consult with Perfection Architectural Systems for their record in service, quality, and reliability in specialty aluminum construction. With over 17 years of continuous customer satisfaction, Perfection Architectural Systems has forged relationships with some of the most prominent architects and contractors in the United States. Perfection Architectural Systems acknowledges the importance of sustainable building practices. We have incorporated green building techniques and principals into our manufacturing processes at our state of the art, 61,000 square foot manufacturing plant. Perfection offers several different green systems for your next aluminum construction project in North Carolina. One of the most reusable, recyclable building materials available today is aluminum, and Perfection Architectural Systems recognizes this fact and only uses the highest quality aluminum materials available for each project. 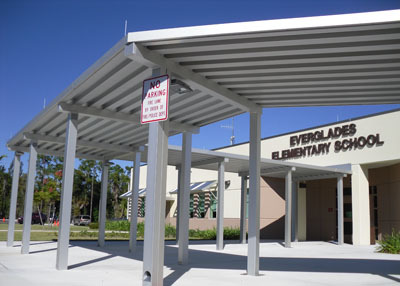 Perfection Architectural Systems is a recognized leader in providing engineered, long- term aluminum walkway canopy solutions. Since our inception in 1993, there has always been a high degree of workmanship, professionalism, and diligence that sets Perfection Architectural Systems apart from other canopy companies. Call Perfection Architectural Systems today at (800)238-7207 and get your next project in North Carolina started.